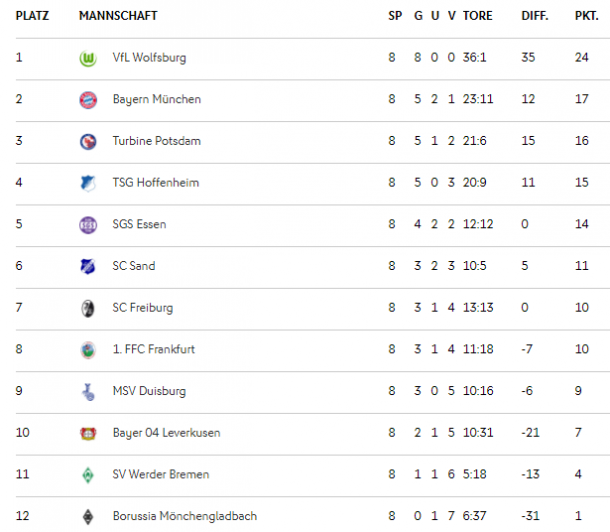 Holding Essen to a respectable draw, Bremen picked up a point before Sand managed similar away to Munich as Wolfsburg avoided a slip-up against MSV and Frankfurt dug out a winner against Freiburg. Elsewhere, Hoffenheim saw off Leverkusen with ease before Potsdam furthered Gladbach’s misery. Getting at the home defence from the first minute, it wasn’t until late in the first half that the visitors broke the duck, Leonie Pankratz’s floated shot from the top of the box lifted over Laura Sieger. The lead doubled after the break as Tabea Waßmuth fed the ball through to Nicole Billa for the Austrian to slot it through Sieger’s knees from 18-yards. The match wrapped up by Lena Lattwein in the last minute of regular time, her fourth goal of the season a firm header at a corner. With a defence that simply doesn’t look good enough for the league it’s in, Borussia suffered another heavy defeat, their second seven-nil loss in three matches. 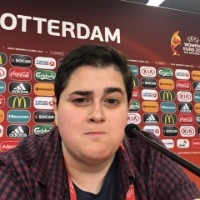 With ‘Gladbach on the backfoot 12 minutes in when Anna Gasper found the back of the net by way of the upright, the visitors stretched their advantage six minutes later as Sarah Zadrazil chanced her arm from range. Two became three not long before the break when Rieke Dieckmann arrived in the box to send Svenja Huth’s rebound spinning into the heart of goal. The Turbines didn’t let up after the break and were soon celebrating their fourth as Lena Petermann grabbed her first of the day, nodding Felicitas Rauch’s dinked cross over Michelle Wassenhoven. Upping her tally for the season, Petermann grabbed a second with her head, sending a worked corner into the net from close range, the rangy attacker wrapping up her trick with yet another well-taken header. The final nail in the coffin hammered in by Rauch after Huth had been felled in the box, the Potsdamer unable to send Wassenhoven the wrong way but her clinical effort chipping the paint off of the post as it went in. Still performing well below their abilities, SGS were left frustrated after yet another slip up, this time in Bremen. Kirsten Nesse’s early close-range goal only enough for an advantage that lasted until first half stoppage time when Katharina Schiechtl raced onto Gabriella Tóth’s lofted pass to fire it beyond Kim Sindermann. Surprisingly blunted in attack, there was little the visitors could do to claim another against Anneke Borbe. 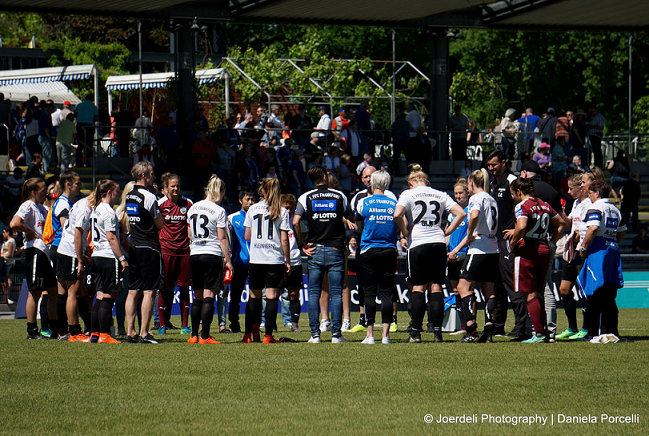 Forced into a first half change that saw Mary Earps get her first competitive minutes for Wolfsburg, the visitors were left frustrated at the break, unable to find a way through the Duisburg defence. The pressure from the champions finally telling after the half when Noëlle Maritz volleyed the ball over the box and into the back of the net, looping it over the rooted Meike Kämper. The lead lasted no more than five minutes, the hosts back in the match courtesy of Meikayla Moore’s deft header putting an end to a run of just under 700 league minutes for Wolfsburg without conceding this season. An unstoppable force, the Wolves regained the lead three minutes later, Caroline Graham Hansen’s recycled corner landing on Pernille Harder’s head, the Dane reliable as ever for WOB. In what was probably the most unpredictable match of the weekend, Frankfurt dug out a late winner. With a goal in the 15 minute ruled out, the Sport Club were left on their heels as the visitors took the lead six minutes later, Laura Feiersinger’s inch-perfect cross neatly volleyed into the net by Laura Freigang. The lead standing until just before the break when Sandra Starke’s quick-fire double had the hosts in front. Following her thumping header, the attacker flicked Giulia Gwinn’s well-placed pass beyond Bryane Heaberlin to leave FFC needing a strong second half. The push and pull continued after the break with Freigang restoring parity just after the hour, the young attacker arriving into the box to slam Géraldine Reuteler’s lay-off into the hungry net. Needing just ten minutes more to complete her hat trick, Freigang gave the Frankfurters the lead, again running through the centre and slotting a square pass into the back of the net, this time teaming up with Feiersinger once more. Like clockwork a third equaliser arrived ten minutes later, Gwinn’s stretched effort pulling the ball back across goal looking like it would be enough for a point until Jackie Groenen was left alone at the back post two minutes from time. The Dutch woman with all the time and space in the world to jump up and nod Feiersinger’s dinked cross into the unguarded goal. Having started the season in rip-roaring fashion, things haven’t been going perfectly for the Bavarians. Given a let off when Nadine Prohaska’s over the shoulder effort was ruled out for an active offside, the hosts took the lead just before the break when Mandy Islacker slipped the ball in at Carina Schlüter’s near post. The lead stood until half-way through the second half when Nina Burger’s glanced header left Manuela Zinsberger rooted in place, ensuring the two teams shared the spoils.